Naomi Parker, Ada Wyn Parker and Frances Johnson. Ran in the Oakland Post-Enquirer March 1942 Now lives at the National Park Service museum archives, click on above image for the link. for $30 in 2014. Click on photo for the link. Wonderful discovery! Looks like Naomi isn't the only treasure that's been missing for decades. Scratch that, She's never been missing, just undiscovered. Acting Chief of Natural and Cultural Resources, for sending me this copy. 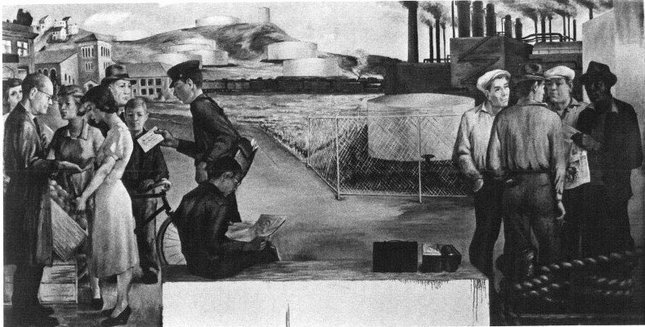 Let me tell you a story about a little 94 year old lady named Naomi Parker Fraley, who once worked during WWII at the Alameda Naval Air Station. The year was 1942 when a photographer came to her workplace to take pictures for a story that would be running in the papers. He took his pictures and left. Soon, an article was published along with a picture from that day, captioned "Naomi Parker" in The Oakland Post-Enquirer. Ada and Naomi carefully cut out the news article and saved it for nearly 70 years. 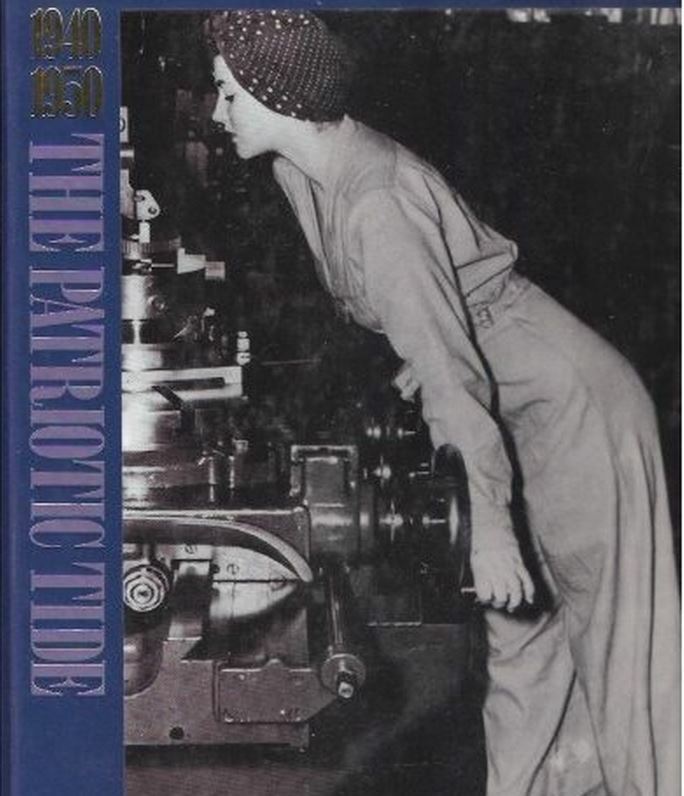 Naomi never thought too much about the picture until 2009 when she and her sister Ada Wyn visited the Rosie the Riveter National Park in Richmond for a gathering of the Rosies. 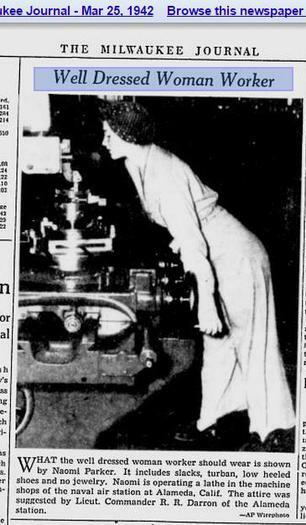 While attending the event, they stepped inside the Park Museum, (SS Red Oak Victory Ship), where they saw a "Big ol' Picture" of Naomi working at her lathe at Alemeda… but it had a different name below it! It was the same picture of herself that Naomi had clipped out of the newspaper so many years ago. Naomi said she talked with someone in charge, she thinks a curator of the museum. Naomi and Ada told the curator that it was Naomi in the photo. I guess the person asked for proof. Naomi and Ada said they had some old newspaper clippings. that there were some identity issues. 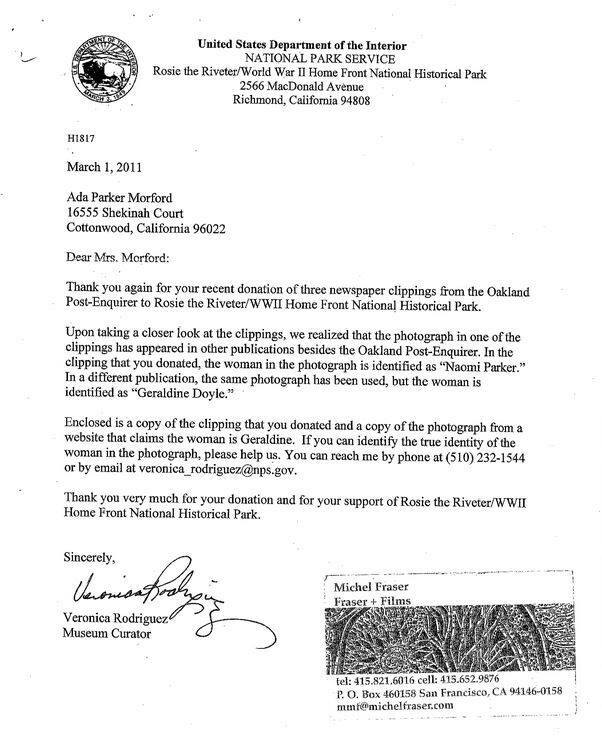 They didn't send back Naomi's original clipping, but they did send back a photocopy. 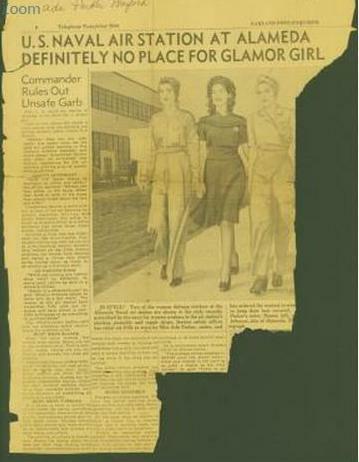 The original clipping now is in their archival collection. Naomi then dropped the matter, but it has been a troubling matter in the back of her mind her for the past four years, wondering why someone would claim her identity. In April 2015, Naomi was hospitalized then rehab for three weeks, where she bought up the issue once again. I told her I would look into it for her if she works really hard to get out of rehab/assisted living. I was just only given the copy of the clipping last week, (9-7-2015). Well thanks to the internet and microfiche at the county library, the clipping is not lost and can be verified as Naomi Parker. On top of that we were able to view an actual 1942 print of the original press photo (from which the news article was based upon) as a recent eBay listing. 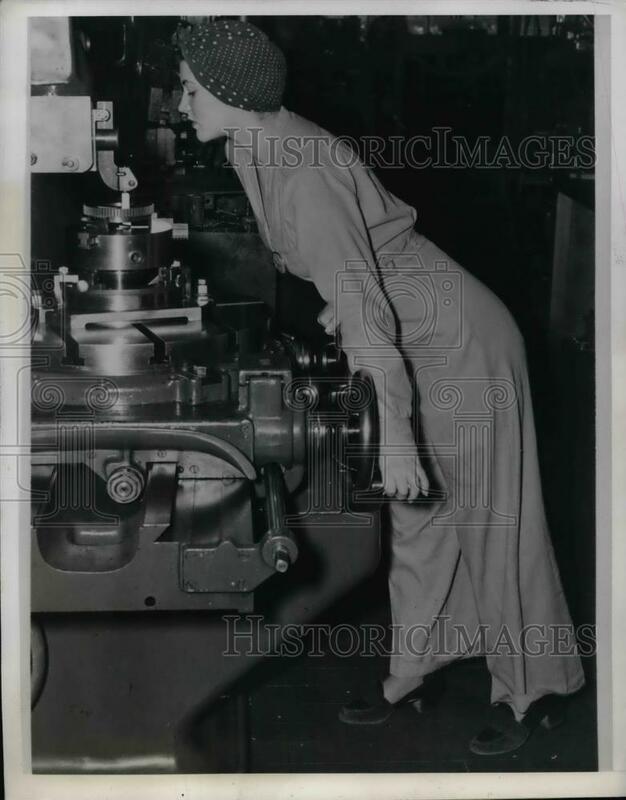 The photo is clearly marked, both front and back, with the press stamps of the date and caption, and the person in the picture is Naomi Parker working at her turret lathe at Alameda Naval Air Station on 3-24-42. Further research revealed that the photo, captioned as Naomi, had also run in other newspapers in March of 1942. I learned that the photo has been misidentified for many years as Geraldine Hoff-Doyle, who claimed it was a picture of her working in Ann Arbor, Michigan at her metal-presser machine, and that the photo was believed by many to be the inspiration for the famous WE CAN DO IT! poster commonly known as Rosie the Riveter. We had no idea of the historical importance this photo, or that it was believed to have inspired the WE CAN DO IT poster of WWII. The great news is Naomi is still alive and I talked with her yesterday. I showed her the Ebay site where they had listed the original photo. She was so thrilled and excited and I think she was proud of me for finding it. The look on her face was the richest reward for my efforts. The more we looked the more we discovered. The photo and the famous poster was and is a very big deal to many, many people... and now is a big deal to Naomi and to us, her family. 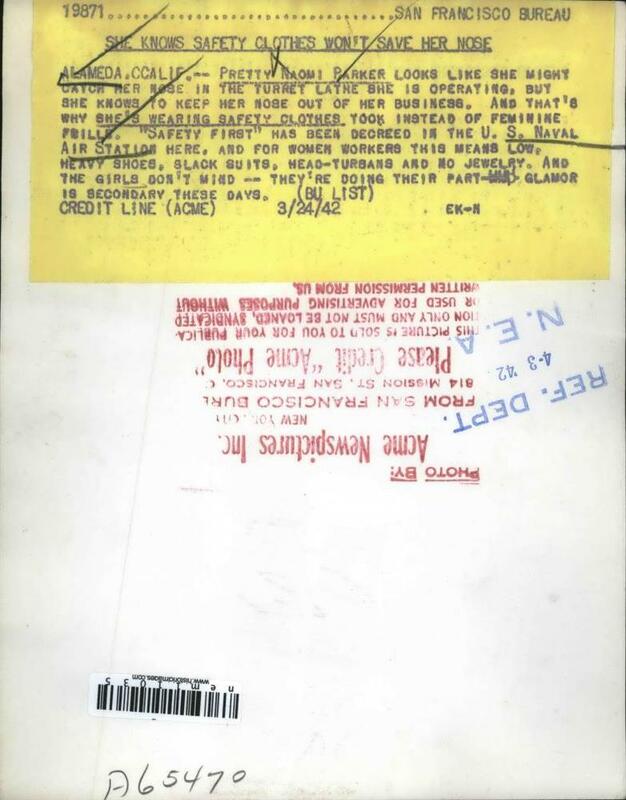 I'm sure that Geraldine Hoff was a very good person and no doubt really believed she was the person in the now historic photo, but 100%, she is not, that person is Naomi Parker Fraley. Naomi is the nicest, sweetest lady and a spiritual person, a finer American you'd never meet. Please help me get Naomi the recognition she is due, while she is still with us to enjoy and share. 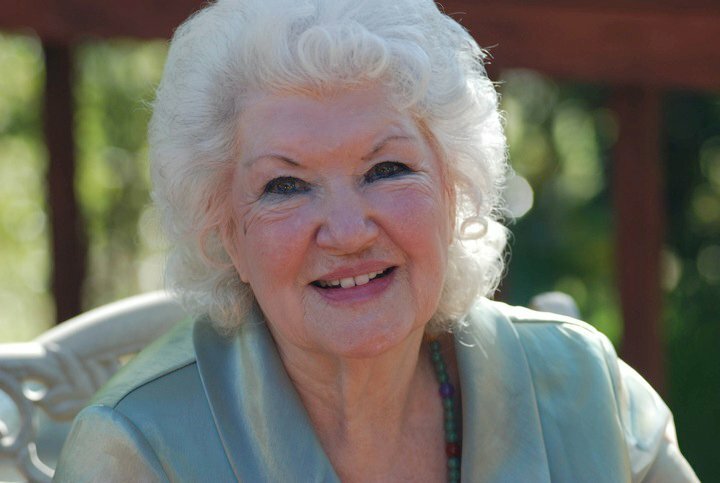 She has so many great stories from this time, and of her life in general. Like I said, she is 94 and in fairly good health, just has a hard time hearing. Milwaukee Journal with Naomi's photo in it, Please click on image above. 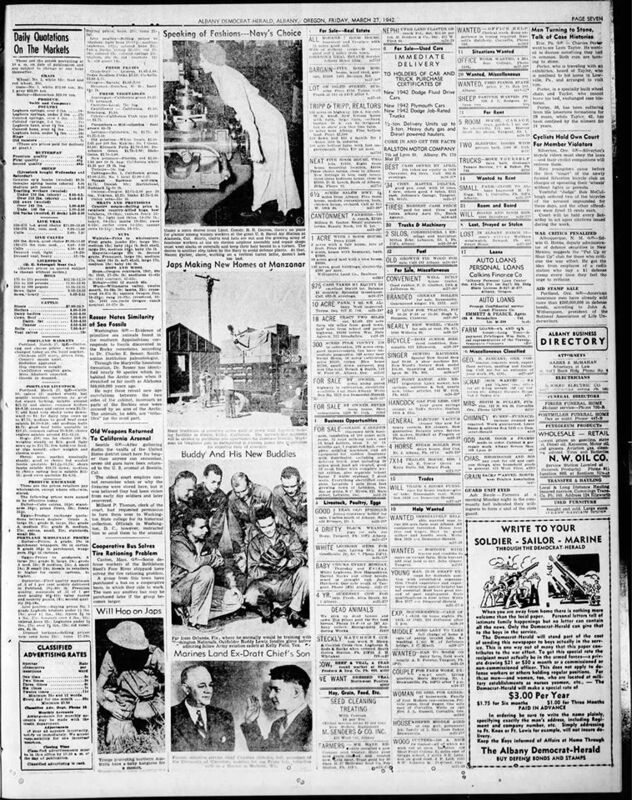 The photo can be found in March, 1942 issues of a least 4 major daily newspapers digitized online at newspapers.com: The Oakland (CA) Post Enquirer, the Twin Falls (ID) Times News, the Milwaukee (WI) Journal, and the Albany (OR) Democrat-Herald. 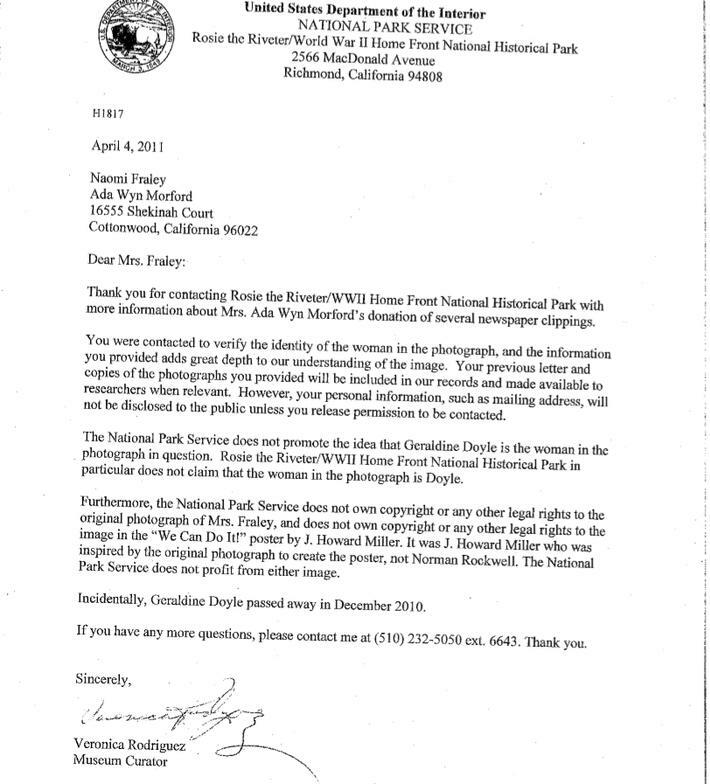 On March 11, 2011 Naomi sent Veronica Rodriguez, Museum Curator, some photo's of herself from that time period along with a notarized copy of her birth certificate with this letter. This letter gave her no comfort.